Timur (c. 1336-1405) was born in 1336 in central Asia, about 50 miles south of the city we know today as Samarkand in modern Uzbekistan. He was Turkic and descended from the Mongols. 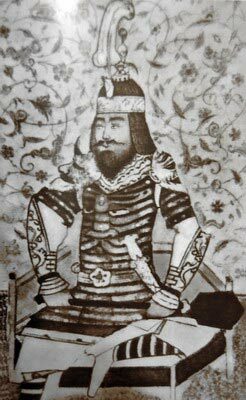 Timur is also known by Western scholars today as Tamerlane, a name which developed from the words “Timur the Lame.” Timur was partially crippled from an early age and was missing two fingers on his right hand. He walked with a limp. Timur’s father’s name was Taraqai, a minor chieftain of the Barlas tribe. Timur considered himself to be a devout Muslim. At a young age, he and the members of his family were kidnapped by a rogue band of Mongol raiders and carried off to Samarkand. Timur’s sheer lust for war and his clever ability to gain the loyalty of his followers appears to have been apparent even from a young age. Scholars today believe that Timur was highly intelligent, charismatic, and certainly a military genius. He was also literate, which was not entirely common at this time. Timur read, wrote, and mastered various languages. When he was young, he organized a small band of warriors who prowled the countryside conducting raids while stealing sheep, cattle, and booty. 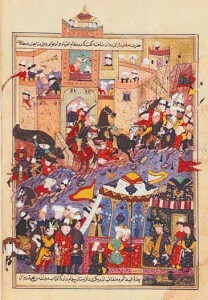 Timur ransacked anyone unable to stop him. Historians suggest that Timur’s injuries were suffered when he was shot by stray arrows while trying to steal sheep from nomadic shepherds. 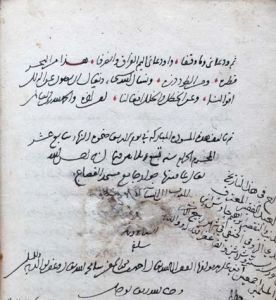 Other accounts are more complimentary; some argue that Tumur was injured in battle while serving as a soldier for hire under the khan of Sistan. As a military leader of Turkic troops in Chagatai, Timur gained experience and became a more adept leader when he trained with the armies of the khans. Eventually he was placed at the head of a force of 1,000 horsemen, leading on an invasion of Khorasan, which he ultimately conquered. This military success prompted Timur to become chieftain of the tribe once ruled by his father, Barlas. Even though he was still serving under the Chagatai khans, his increasing control of the military enabled Timur to establish rule from a position of a general, making the khans of Chagatai his puppets. At about this time, Timur developed a fierce rivalry with his brother-in-law, Husayn. They ruled together for some time even though both were strong and did not like sharing power. Timur eventually overthrew Husayn and established himself as the khan of all Chagatai. From a position of total control, both militarily and politically, Timur was poised to begin pursuing his ambition of world conquest. This meant gaining uncompromised power over the Mongol Empire as well as all the Muslim controlled nations of Central Asia. Timur’s desire to become a ruler of the entire Mongol nation remained unchallenged. His devices were as much political as they were military. A significant problem stood in his way; Timur was not a direct descendant of Genghis Khan. In fact, he was not even entirely Mongol, or possibly not a Mongol at all, which caused his desire for the title of “Khan” to be at best problematic. Although the people of the Barlas tribe were considered Turkic-Mongols, this was not enough to convince his people that he was “pure” Mongol. Consequently, Timur decided to take a Mongol princess as his wife, one who could claim direct lineage from Genghis Khan. Timur also did not belong to the right sect of Islam to claim the title of Caliph – the supreme ruler of a Muslim realm. He overcame this by claiming to be a Muslim with “supernatural” authority. Ultimately, Timur rewrote the ancient rules in order to make the past titles irrelevant. He became an Amir, which is equivalent today to a general. Through sheer force, Timur conquered all adversaries, and forced rule on anyone and everyone that challenged him. Once Timur established his rule in the regions of central Asia, he was poised to send his army north, south, east and west. Over the next 35 years, his armies swept as far as the surrounding regions of the Caspian Sea, through the Ural Mountains, and on to the Volga River. Timur even reached the borders of Western Europe. 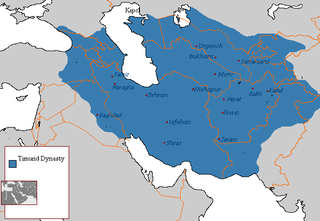 He conquered all of Persia, which today are the modern states of Iran, Iraq, and Syria. Timur’s armies also moved into India and were able to sack the city of Delhi. The attack on Delhi was among the most brutal and violent massacres in history. 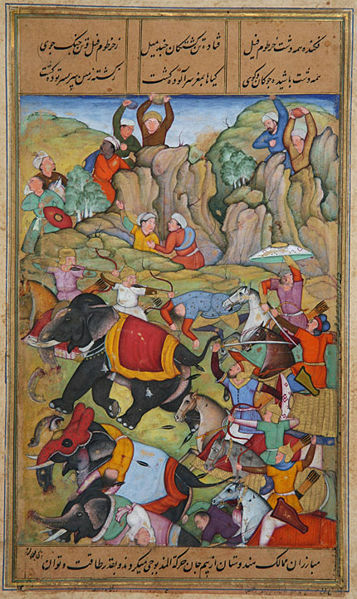 In one instance, Timur ordered the killing of more than 100,000 unarmed captives of the Indian Sultan, a terrible slaughter which occurred in only one day. Timur’s implacable conquests had the leaders of the European city-states in sheer panic. The kings and princes of Europe, including those of France, England and Spain, all sent envoys to the court of Timur in hopes that diplomacy would be an alternative to outright war. However, Timur chose rather to turn east and conquer the Ming Dynasty of China. Timur died in February 1405 in a winter campaign, before his attempt to overthrow Ming could occur. By the timed Timur died, all that he had conquered collapsed Timur knew only two things: Power and Conquest. Conquest was an end in itself. Unlike any other Asian rules of the past, Timur chose not to create a strong local infrastructure or a long-lasting imperial government. He created very few codified laws, appointed no rulers to assist him locally, and established no bureaucracies. By the time of his death, scholars estimate that Timur’s wars killed 17 to 20 million people. His conquests took with them some of the most terrible battles in human history. Timur killed 5% of the world’s population at the time – at least 17 million people.